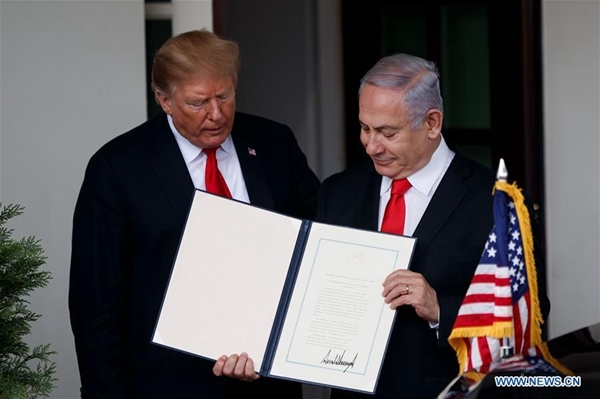 The proclamation said that it is "appropriate to recognize Israeli sovereignty over the Golan Heights" because of the security need of Israel. "This was a long time in the making," Trump said before signing the decree at the White House with visiting Israeli Prime Minister Benjamin Netanyahu standing alongside. Netanyahu welcomed Trump's move over the Golan Heights, territory that Israel seized from Syria in 1967, and called the recognition "historic." "In a day of history, we have never had a greater friend than President Trump," he said. Trump expressed condolences to Netanyahu for the Gaza rocket attack and affirmed Israel's right to defend itself. The two leaders also discussed shared interests in the Middle East, according to the White House. In response, Syria's foreign ministry called the U.S. recognition of Israeli sovereignty over the Golan Heights as a "blatant attack on the sovereignty and territorial integrity" of Syria, according to the state news agency SANA. UN spokesman Stephane Dujarric also said on Monday that UN Secretary-General Antonio Guterres is "clear that the status of Golan has not changed." U.S. president signed a proclamation recognizing Israel's sovereignty over the disputed Golan Heights.